President Donald Trump says Virginia Gov. Ralph Northam’s Republican opponent would have easily won the 2017 governor’s race if the racist photo in Northam’s yearbook had been discovered during the campaign. Trump tweeted Saturday night that Republican Ed Gillespie must believe his opposition research team committed “malpractice” and “dereliction of duty” by not uncovering the photo ahead of the 2017 election. 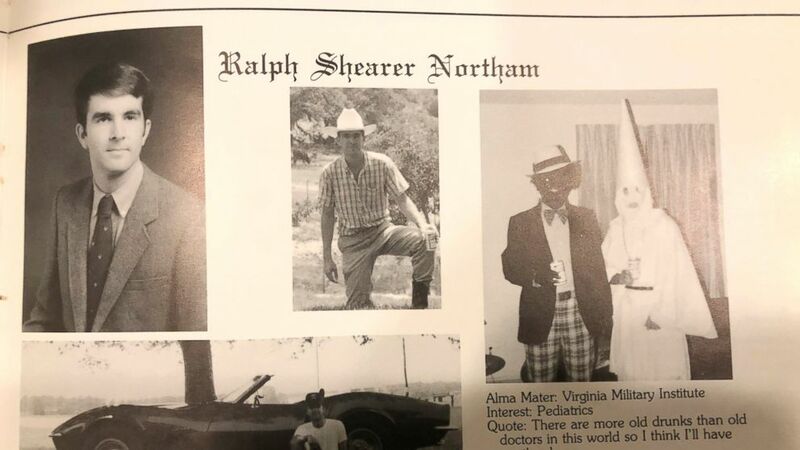 The photo on Northam’s medical school yearbook page shows one person in blackface and another hooded in white Ku Klux Klan regalia. Northam defeated Gillespie by about 9 percentage points, but Trump says Gillespie would have won by 20 points if someone had found the photo. Earlier this week, abortion opponents accused Northam of supporting infanticide. In a radio interview, Northam described a hypothetical situation in which an infant who is severely deformed or unable to survive after birth is left to die. Both of Virginia’s U.S. senators say they have called the state’s governor, Ralph Northam, to tell him that he must resign after a racist photo was discovered on Northam’s page in a medical school yearbook. Sens. Mark Warner and Tim Kaine are joined by the dean of Virginia’s congressional delegation, Rep. Bobby Scott, in a statement Saturday night that says they have told Northam that they no longer believe he can effectively serve as governor. Northam says he is not in the photo, which shows someone in blackface and someone in Ku Klux Klan robes. Democratic presidential hopefuls are getting their first major test on how they will address racial tensions that have polarized American life. A racist photo tied to Democratic Virginia Gov. Ralph Northam from his days in medical school has prompted them to deal with the question. Nearly every major declared and potential Democratic candidate called for Northam’s resignation after the disclosure of the yearbook photo, which shows one person in blackface and another hooded in white Klan regalia. Their reactions came before Northam said during a news conference Saturday that he was not in the photo on his page of the 1984 yearbook. A prominent Democratic strategist, Symone Sanders, says candidates already face challenges explaining their own records on racially fraught matters and now must deal with the Northam issue. Virginia’s attorney general is calling for Gov. Ralph Northam to resign. Herring is the latest prominent Democrat to call for the Democratic governor to step down. Others calling for Northam’s resignation include the Virginia Democratic Party, the state House Democratic Caucus and many Democratic candidates for president. Herring’s statement followed Northam’s press conference at which he denied being in a medical school yearbook photo that shows a person in blackface standing next to someone in a Ku Klux Klan costume. Northam, however, admitted to wearing blackface as Michael Jackson at a dance contest. Virginia Gov. Ralph Northam has admitted to wearing blackface while dressing up like Michael Jackson at a dance contest around the time he was in medical school. Northam made the admission Saturday at a press conference where he denied being in a photo that shows a man in blackface standing next to someone in a Ku Klux Klan costume. That image appeared alongside photos of Northam in his medical school yearbook in 1984 and has sparked a torrent of calls for his resignation. The Democratic governor said he darkened his face with “a little bit” of shoe polish for his Michael Jackson costume at a 1984 San Antonio talent show. A man who went to medical school with Ralph Northam says he also didn’t buy the class’s 1984 yearbook or see it until decades after it was published. Walt Broadnax is one of two black students who graduated with Northam. He said by phone Saturday that students submitted photos for someone else to lay out. Broadnax saw his yearbook page for the first time Saturday. He said it turned out how he intended with photos of family and a woman he was dating. Broadnax defended Northam and said he’s not a racist. He said he believes Northam’s statement that he wasn’t in the photo of a man in blackface standing next to someone in a KKK costume. He said the school never would have tolerated someone going to a party in blackface. In his statement issued Saturday, Fairfax doesn’t call for Northam to resign because of racist photos on Northam’s 1984 yearbook profile page. Northam said Saturday that he hadn’t seen photos of one person in blackface and another wearing a Ku Klux Klan until someone showed them to him Friday. He says he won’t resign despite widespread calls that he step aside and let Fairfax lead Virginia. In a statement on the school’s website , President Richard Homan said the photo of one person in blackface and another in a Ku Klux Klan hood is “absolutely antithetical” to the school’s principles, morals and values. The photo was on the profile page of Virginia Gov. Ralph Northam, who says he believes he’s not one of the men in the picture. North Carolina’s governor is calling on Virginia Gov. Ralph Northam to resign because of a photograph on Northam’s yearbook profile page. A photo from a 1984 medical school yearbook surfaced Friday, showing a person in blackface and another wearing a Ku Klux Klan hood. The photo was on Northam’s profile page. She said Saturday via Twitter that she is joining her colleagues in Virginia in calling for Northam “to do the right thing” so that the people in Virginia can heal and move on. Virginia Gov. Ralph Northam is planning a news conference where he’s expected to say he’s not resigning and believes he was not in a racist picture featured in his 1984 medical yearbook. Northam’s office on Saturday said the 2:30 p.m. news conference would take place at the Executive Mansion. Northam has faced a torrent of criticism and calls for his resignation after a photo surfaced from decades ago that showed two people in racist costumes: One person is dressed in blackface, and another is wearing a full Ku Klux Klan uniform.The photo appeared in Northam’s 1984 medical school yearbook. On Friday, Northam apologized for appearing in the photo. The Republicans join a growing chorus of elected officials in Virginia and elsewhere calling for Northam’s resignation.